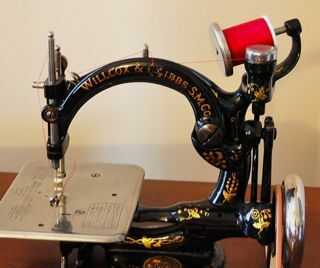 The foot hemmer is attached to your machine in place of the regular presser foot and is used for hemming the edge of material, making hemmed and felled seams, and you can also hem and sew on lace in just one operation. To attach, raise your needle to the highest position, remove your presser foot, and attach the foot hemmer. At times, the foot hemmer can be a little tricky to learn. With practice you will do amazing things, but in the beginning don’t be surprised if your material and your hems are “crooked”, to say the least. Sit and practice, practice, and practice. 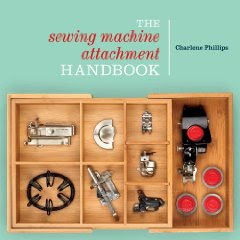 Once you get the hang and learn your own tricks, this is a wonderful little attachment for making those dainty hems. Take it slow and you will have a perfect hem every time. Fold the edge of your material twice, about 1/8” each time. Do this for a distance of about 2 inches and then I finger crease the folds. 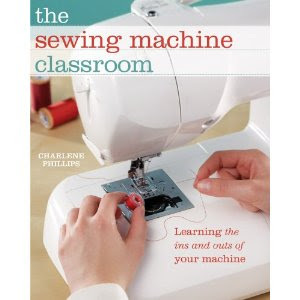 Place about three or so inches of your needle and bobbin threads under the hemmer. 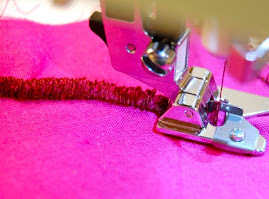 Place your creased edge of material under the hemmer and have your end of hem directly under the needle. Lower the hemmer foot and tack this end with about two or so stitches. Raise your hemmer again. Pull the threads and the hem slightly away from you with your left hand (while holding the threads) and pull the material toward you with your right hand into the scroll of the hemmer until the tacked end is caught in the hemmer. I do sort of “jiggle” it back and forth very gently until I see it is all within the hemmer foot. Then I am ready for the next step. 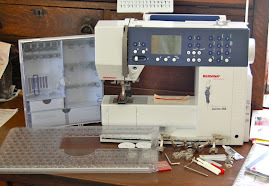 Lower the hemmer and begin sewing, again pulling the threads back while sewing. It is important to keep the mouth of the hemmer full of material so you have an even hem. Hint: I do try to manually have about 1/8” hem folded right before the material goes through the hemmer foot. So, your left hand is in the back of the presser foot keeping the material taunt and your right hand is in front, guiding the material through. Place the right sides of your material together. They will not match at the edge. You want to have the upper piece of material about 1/8” to the left of the material on the bottom. Stitch the two pieces together using your hemmer foot. Open the seam, wrong side up, and now hem the seam, stitching it flat. Your hemmer foot will now “grab” and turn under the top piece of material. 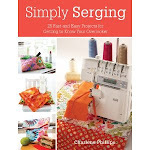 Begin sewing in the normal manner. Hold the hem in position with the needle. Raise your presser foot and insert the edge of your lace in the lot of the hemmer and pull it back under the hemmer. 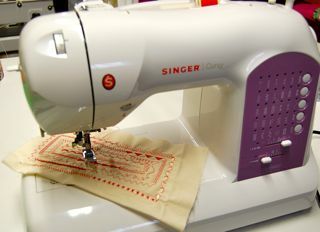 Lower your presser foot and start sewing. Your lace will be caught on the edge with the needle. Guide the hem with your right hand and the lace with your left hand. What you can do with this little attachment is just endless! Be creative and have fun! Thank you so much for explaining this foot. I tried to use it a long time ago and gave up because I couldn't figure out how to feed the fabric into the foot and get it started. I finally did it! With your explanations and those nice clear photos. I'm getting ready to use the hammer foot today on a prom dress that I'll be wearing tonight. Your post REALLY helped me understand how to use it.